The new establishment, by a co-owner of Shino’s, carries old-school touches: gentlemen’s cuts, a straight-razor finish, wood paneling. 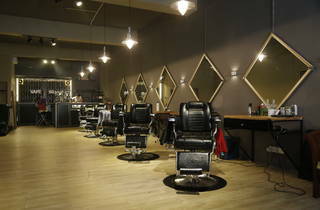 Your hair is in good hands; the hairstylists are themselves hyperstylish. At the back, a vape shop holds court.